UPS Boeing 777-200 Freighter. A repaint of the Project Open Sky B777-200 freighter v2 in UPS new livery. Includes inbuilt scenery loaders and pushback tug. Repaint by Jim Waters. Tested only in FSX ... might work for FS2004. This model includes Service Pack 1 for the 772v2 LRF. This FDE includes Service Pack B for the 772v2 LRF. Operation: (*tested in FSX ... requires quick Shift+E+number for inbuilt scenery to be activated. UPS Boeing 777-200 Freighter on runway. The archive posky_ups_b772f.zip has 416 files and directories contained within it. This Boeing aircraft jet was something I’d never came across before, but given the fact I had used the old Project Open Sky B77-200 freighter in the past I knew it would be worth checking out. All I wanted to see, really, was the detail of the model and to see just how intricate the whole thing would have looked compared to the very high quality of the textures that were present on the original POS model. I have to say, though, that I was very impressed by the quality of the “repaint” and the overall style of the livery, it matched the UPS style in real-life and looked very authentic. Given the quality of model it had to work with this might not seem too impressive but I guarantee that anyone who has used POS models in the past will understand the challenge of reaching that level of quality in your own livery designs – and this would be in good company amongst the rest of the products that have been released by the group in recent years. The aircraft itself is authentic and incredibly detailed with everything from the steering and suspension made to feel just as they should right down to the scale and shape of the model being just right. It has opening doors and various other awesome animations that come to life, too, which makes it even easier to fly as you can see the whole thing working in tandem instead of feeling like a magic flying box. The opening doors and rolling wheels all come together to make sure the whole aircraft feels alive, but it’s the attention to detail in the interior design that made that possible for me. The quality of the textures – not to mention the attention to detail on what has been included and added in – is absolutely staggering. The large team of work clearly took the advisory instructions of Aaron Seymour and Corey Ford, who have managed to create a really authentic framework that matches the original class and style of the real thing. If you are looking for an easy way to prepare and understand what makes aircraft stand out in flight simulators, it’s the performance and the overall details. It also comes with some very nifty and simple instructions for installation, with some very basic movements having to be made along the way to make sure that it all lines up together and works properly. It also has various different operational hotkeys that you can press that make everything move in tandem together, ensuring that doors for the cargo hold and the passenger areas can be opened with just a simply press of Shift + E +1-4 depending on what door you want to actually gain access to the plane with. One thing to look out for, though, is the fact that trying this in FS2004 will be a waste of your time – this was built for FSX so make sure you stick with FS when you are using it! When I try to take off from Louisville, I keep overruning the runway, as I can't seem to rotate the aircraft. I also can't control the autopilot. Why is that? The instruments are all blackout... how to display the gauges? Downloaded and installed. Plane ran fine util mid flight, went to adjust heading and it just sat there. Fiddled with some auto-pilot controls and then it took off in a bank like it should..however it met the set heading and continued without leveling off. From then on it wouldn't take heading changes at all. How do you adjust the crs? Hi Stephen, I'm not the author of this addon nor am I an expert of flight sims, but I believe thats a problem with directX10. If you disable that from the settings, you should see the textures fine. 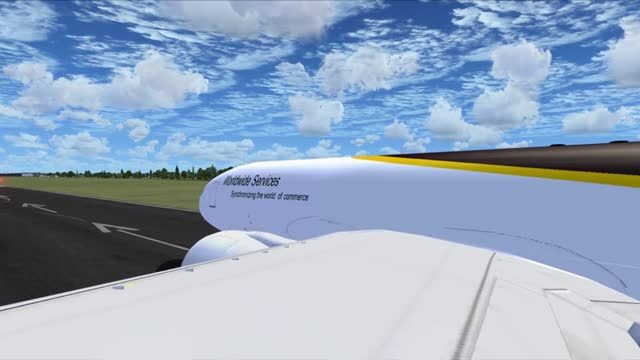 I downloaded this aircraft, followed the install tips, but when I started the plane in FSX, the virtual cockpit was plain white with no detail, only a 2d was available. The outside view showed a flat white plane, no paint work. The GPS does'nt work, all in all very disappointed. I would appreciate some comment about how I can rectify this plane to act as it should.